You need to create an account at Last.FM and configure your player to send all tracks you're listening to Last.FM. Check it out the Last.FM website for more details. This plugin uses the CURL library. If your server doesn't have this library, WP-Last.FM plugin tries to get the info by using the "fopen" function automatically. Upload to your plugins folder, usually `wp-content/plugins/`. A new tab should appear at the plugin screen. 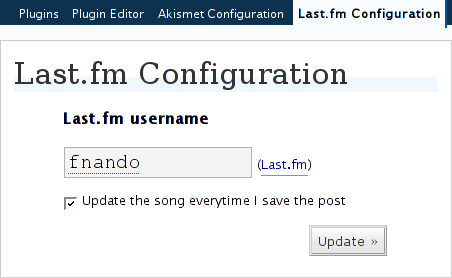 Inform your last.fm username and press the "Update" button. After saving a post, a "custom field" will be saved containing the last played song. If you have no songs in your recent tracklist, this field won't be added.